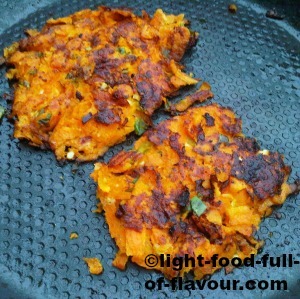 Allow me to introduce you to some incredibly yummy sweet potato rosti cakes – grated potato cakes. They are easy to make and perfect to eat as a light lunch or supper together with a big salad. I like to serve them with either a tomato-chilli jam or a tomato salsa/sauce. I find that it is incredibly handy to have some kind of tomato salsa or sauce in the fridge. When I want something that is quick to make, I simply cook some spaghetti (wholegrain spelt spaghetti in my case) and top it off with some tomato sauce/salsa and either grated parmesan or crumbled feta cheese. An easy and quick way to make a tomato sauce is to gently fry half a chopped red onion and a couple of crushed garlic cloves in a bit of olive oil for about 5 minutes. Increase the heat a little and add chopped fresh tomatoes (250g, 9oz)/ or a tin of chopped tomatoes together with a good splash of balsamic vinegar and a tablespoon of tomato puree. Season with salt and pepper, stir and let it all simmer for a further 10 minutes. If you’ve got some fresh basil, add that as well. 1. Pre-heat the oven to 220C/Fan 200C/425F/gas mark 7. In a bowl, grate the sweet potatoes and red onion. Add the chopped spring onions (scallions), eggs and feta cheese, Season with salt and pepper and mix everything together. 2. Line a baking tray with baking parchment. Add a bit of oil to a frying pan over a medium high heat. Using a tablespoon, place a spoonful of the mixture into the frying pan and flatten it out into a thin cake – depending on the size of your frying pan, you can fry 3-4 cakes at the same time. Fry for about 2 minutes before carefully turning over and fry for a further 2 minutes. Transfer the fried potato cakes to the baking tray and continue to fry the rest of the mixture. 3. Once you have used up all the mixture, place the baking tray with the fried rosti in the oven and bake for 5 minutes.